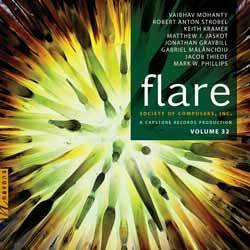 Composers: Society of Composers, Inc.
Flare is the 32nd volume of music from the Society of Composers, Inc, showcasing another collection of work by their composers. What a difference a year makes. 2017's offering (Volume 31 - Ascend) was an album I just didn't warm to in the slightest. I'd even go as far as to say I detest it. However, Volume 32 - Flare is a totally different beast altogether. The album opens with 20-year-old Vaibhav Mohanty's 'Rhapsody No. 1' (2017), which draws on elements of Western classical composition, jazz, and Indian traditional music. Robert Strobel's 'Refugees' is a piano composition that explores the human drama of displacement in profoundly thought-out rhythmic and melodic structures; Continuing with the musical tradition of the 20th century, Keith Kramer transcends Olivier Messiaen's harmonic heritage in his oboe/piano duo 'L'etere del Tempo'. 'Rejuvenated' by Matthew J. Jaskot perambulates a futuristic universe of musical expression in seven diverse piano variations, springing forth from a simple pentatonic melody. In contrast, Jonathan Graybill draws inspiration from ancient Cherokee mysticism and lends a mysterious voice to the black-capped chickadee in 'Tsigili'I', illustrating its mythological association as a messenger of wisdom and truth. In 'Song of the Avadhut', Romanian composer Gabriel Mălăncioiu aims to affect human consciousness in an avant-gardesque duet between soprano and violin, influenced by the teachings of modern and ancient mystics. Jacob Thiede's 'When All Else Fails' contrasts the sonorous texture of a tuba with the mathematical perfection of computerized sine tones. In 'Dreams Interrupted', Mark W. Phillips fuses jazz, blues, and classical elements into a rhapsodic tribute to the cultural heritage of Memphis TN. Not only is this a diverse and lovingly produced collection of pieces, but it also wonderfully showcases how talented and visionary the members of the Society of Composers, Inc. are. If you want to keep your finger on the pulse of modern classical music you really should be following this series.